One of the rockets launched this morning landed inside a classroom at a high school where students were taking their finals. 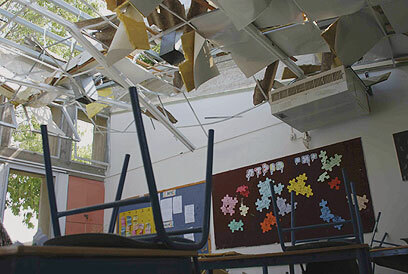 Luckily, the classroom was empty since it was not fortified, which is the only reason a huge disaster was averted. Several students were hurt in a nearby classroom and all exams were suspended. The only students who arrived at school today were those who had to take their matriculation exams, and they were placed in fortified classrooms. Eli Moyal, the mayor of Sderot, said that although the country and Gaydamak had buses take residents to nearby towns, it was only to “catch a breath” and not to get everyone out of the town. That would be giving them what they want. Extensive retaliation is being planned for Gaza. And this isn’t a war zone? Watch this video from Channel 10 News in Israel. Someone was video taping one of the rocket attacks and the rocket landed just by him – literally. In their back yard. Israel is going to plan a retaliation, and I’m normally against it, but seriously – over 40 rockets launched in the past 2 days, and this didn’t just start now. Dozens injured, many “only” shocked, but that’s still not normal. The Shin Bet, in cooperation with Southern District Police, in recent days thwarted an attempt to smuggle explosives from the Gaza Strip into Israel through the Karni Crossing, it was released for publication Wednesday. A number of Palestinian laborers tried to smuggle the explosives with the apparent aim of carrying out a terror attack in Israel. At the start of the week security forces discovered six kilos of standard TNT hidden inside an iron cage used to transport goods from Gaza into Israel. The same day, three Israeli truck drivers from the Negev were detained for questioning for suspected involvement in transporting the explosives. An interrogation of the suspects revealed that Mahmoud Samih Abu Nagi, a Palestinian residing in Sheikh Radwan in Gaza who works at the Karni Crossing coordinated the transfer of the explosives into Israel. Meanwhile, the same night Rami Samir Abid, 25 from Tulkarm, who was allegedly supposed to collect the TNT once it reached Israel, was arrested at his home. You are currently browsing the archives for the palestinian state category.